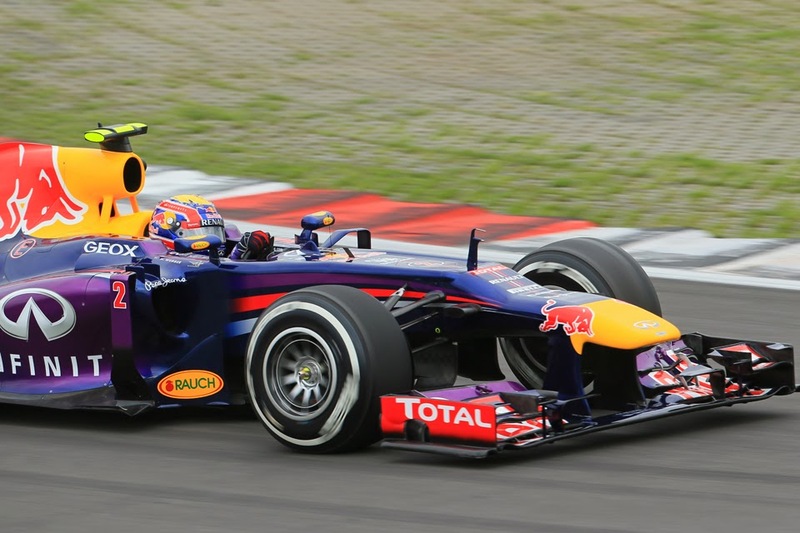 Perhaps the aspect of the 2013 Korean Grand Prix that will live longest in the memory was not an act by any of the competitors. As you'll no doubt be aware by now, on lap 38 of the Yeongam race we had the bizarre sight of the pack at racing speeds turning onto the main straight to find a fire recovery jeep before them, tooling towards turn 3 to assist putting out Mark Webber's aflame Red Bull in the run-off area. It's the sort of thing we thought long in the past in F1's ultra safety-conscious age. And for all of the titters that were raised in response the consequences of a racing car colliding with such a vehicle, presumably getting underneath it with its open cockpit exposed, don't bear thinking about. It's probably just as well that the cars came upon it on a long straight, with plenty of time to see it and react. Sadly in response to it all it seems plenty haven't been able to resist playing the 'blame the naive locals' game. Ted Kravitz for one on his post-race 'notebook' programme said that it all was 'a sign that there isn't really a motorsport heritage in this country'. And he wasn't the only one: Jonathan Legard said roughly the same thing on the BBC's Chequered Flag podcast: 'This goes back to the fact that Korea does not have a racing history...that did not reflect well on the organisation'. Similar sentiments have been expressed frequently on social media too. But is this fair? On one hand, although the initial word given to the media after the race was that the jeep was released as a result of a unilateral decision by a local Chief Fire Marshal, this was wrong. In fact, it was a mistake the FIA race control made all by itself (and, do you know what, I'd really love to know why the 'blame the locals' story was given to the media in the first place, and by whom). The error was that race control gave the OK to release the vehicle mistakenly believing it was stationed at turn 3, rather than at turn 1. It seems a rather fundamental error, as at any motor sport event it's part of race control's responsibility to know where the recovery vehicles are positioned, indeed you'll see the clerk of the course do a lap in a course car before the first session of the day to check this among other things. So, no blame to the locals there from what I can tell. As for the length of time it took to put the fire out, yes it did seem on the long side, but Webber was out of the car so there was next to no danger to life. And for what it's worth marshals are trained to draw something of a distinction on that basis. In other words, if the driver's not inside a burning car there's less of an emergency to require risking yourself by vaulting the barrier and putting yourself into the line of fire of passing cars in order to put it out. Those such as Christian Horner might seethe at seeing their car burn of course, and a fire always looks spectacular. But to coin the phrase that marshals like to use: the car's already dead. For all of F1's appetite for moving into uncharted motorsport territory, when things go wrong it's not necessarily the local volunteers at fault. The experienced, expert members of the sport's establishment are just as capable of erring. We saw this at Yeongam.